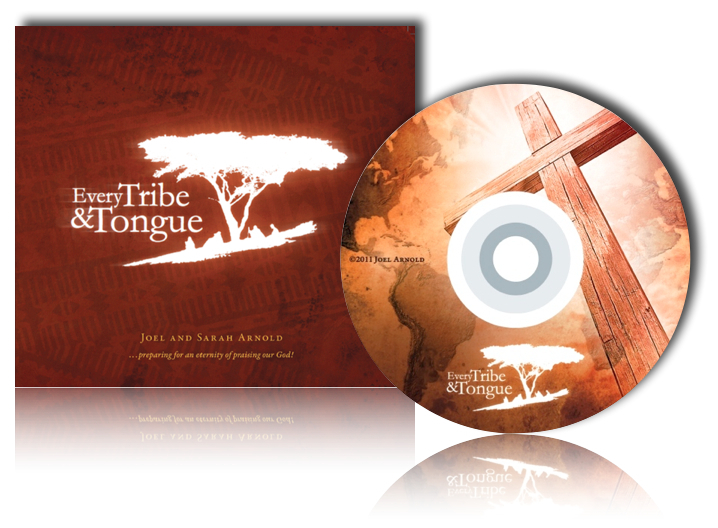 Every Tribe and Tongue--preparations for an eternity of praising our God! While we prepared for deputation, we had the opportunity to produce a CD of conservative Christian music. It contains 16 tracks of instrumental, mixed vocal quartet, and several duets. Our prayer is that this CD will serve as an effective prayer reminder for people to remember our ministry. If you would like to obtain a copy, please contact us. Also, you will find the words to each track listed here. Beneath the light of distant skies, a sorrow fills the searching heart. A prayer that God would show the way, His wondrous truth impart. The love of Jesus and His power to make the wounded spirit whole. A vision calling in the night, O who will come for us today? Oh who will help us in our need to cast our night away? Into eternity they go with every day and passing hour. Without a messenger of truth to bring the Spirit's mighty power. A song of hearts from sin released, a song of joys unknown. The heart that sings of Jesus' love and of the sinner's ransomed soul. May hear the Savior's name and know redeeming grace. From every tribe and tongue! Out of the depths I cry to Thee, O Lord, hear my prayer. Let your ears be attentive to the voice of my pleas for mercy. If you Oh Lord should mark man's sin, O Lord, who could stand? But with You, there is forgiveness that you may be feared. I wait for the Lord; my soul waits, and in His Word I hope. My soul waits for the Lord more than the watchmen for the morning. O Israel hope in the Lord, for with the Lord there is steadfast love. O Israel hope in the Lord, for with Him is plentiful redemption. Oh Israel hope in the Lord, for with Him is plentiful redemption. To You I lift up my eyes; O You Who are enthroned in the Heavens. To You I lift up my hands; O hear my prayer, I cry to You. To You I lift my soul; O Lord my God, in You I trust. Christ is risen alleluia, risen our victorious head. Sing his praises alleluia, Christ is risen from the dead. Gratefully our hearts adore him as his light once more appears. Bowing down in joy before him, rising up from grief and tears. Christ is risen, all the sadness of His earthly life is o'er. Through the open gates of gladness he returns to life once more. Death and hell before Him bending, he doth rise the victor now. Angels on his steps attending glory round his wounded brow. See the grave give up her master, see her powers before Him fall. We are Christ's in him forever, we have triumphed over all. All the doubting and dejection of our trembling hearts have ceased. Tis his day of resurrection. Let us rise and keep the feast. Our Lord is risen! Christ is risen, alleluia, sing his praises to the sky. Raise the shout of heaven's chorus, hear the earth's triumphant cry! Alleluia! Christ is risen ! In His beauty we adore Him. Sacrifice for Adam's race. In his glory we behold him, throned in might and robed in grace. The Lord is near to all who call on Him in truth. Call on Him. Call on Him while He is near. Draw Near to God; He'll draw near to you. May the mind of Christ my Saviour live in me from day to day. By his love and power controlling all I do and say. May the word of God dwell richy from hour to hour. So that all may see I triumph only through His power. May the peace of God my Father rule my life in everything. That I may be calm to comfort, sick and sorrowing. May the love of Jesus fill me as the waters fill the sea. Him exalting, self abasing. This is victory! May I run the race before me strong and brave to face the foe. Looking only unto Jesus as I onward go. May his beauty rest upon me as I seek the lost to win. And may they forget the channel, seeing only him. to proclaim His glory and sing of His fame. As servants of the Lord for the sake of His name? to magnify his mercy and praise His holy name. Triumphantly they sing, worthy is the Lamb! Alleluia to the King, to the great I Am! For the sake of Thy name we'll go forth to serve thee. For the sake of Thy name, faithful worshippers to seek. Thy Word throughout the world for the sake of Thy name. And bear thee through the evil days. The soul that trusted Him indeed. May the mind of Christ my Savior live in me from day to day. May the word of God dwell richly in my heart from hour to hour. God of time, God of space, meet with us in this place. Sinful man helpless lost, thou has paid the dreadful cost. Take away our bent to sin, wash our hearts and cleanse within. lamb of god slain for me, lamb of life hear my plea. Bread of life, daily bread, by thy grace our souls are fed. Broken once, all to feed, give us strength for every need. Blest communion through the son, all our hearts are knit as one. Bread of life, daily bread, to thy feast we are led. King of kings, Lord of lords, heavens anthems shout the chords. Holy God, angel bright, conquering all the hosts of night. Alleluia , praise the lamb, God of ages, great I Am. Master Lord, claim thine own, take my heart as Thy throne. Years I spent in vanity in pride, caring not my Lord was crucified. By God's word at last my sin I learned. Then I trembled at the law I'd spurned. Till by guilty soul imploring turned to Calvary. Oh the love that drew salvation's plan! Oh the grace that brought it down to man. On the mighty gulf that God did span at Calvary. Mercy there was great and grace was free. Pardon there was multiplied to me. There my heart burdened soul found liberty. At Calvary. Oh Master let me walk with thee in lowly paths of service free. Show me the secret help me bear the strain of toil, the fret of care. and guide them on their homeward way. In peace that only Thou canst give, oh Master let me live with thee! Master let me walk with thee, with thee! CHORUS:Oh, love of God, how rich and pure! In heavenly love abiding no change my heart shall fear. And safe is such confiding for nothing changes here. The storm may roar around me, my heart may low be laid. But God is round about me, and can I be dismayed. Wherever he may guide me, no want shall turn me back. My shepherd is beside me and nothing can I lack. His wisdom ever waking, his sight is never dim. He knows the way he's taking and I will walk with him. Green pastures are before me which yet I have not seen. Bright skies will soon be o'er me where darkest clouds have been. My hope i cannot measure, my path to life is free. My saviour is my treasure. My saviour is my treasure! And He will walk with me! Before Jehovah's mighty throne all nations bow with thankful joy. And know the Lord is God alone with all your powers His praise employ. Our wandering souls to claim. Wide as the world is Thy command. Vast as eternity Thy love. Firm as a rock Thy truth must stand. Thy power reign in heaven above; Thy power reign in heaven above. Shall fill thy courts with praise. Alleluia!